The Sierra Madre Tattler! 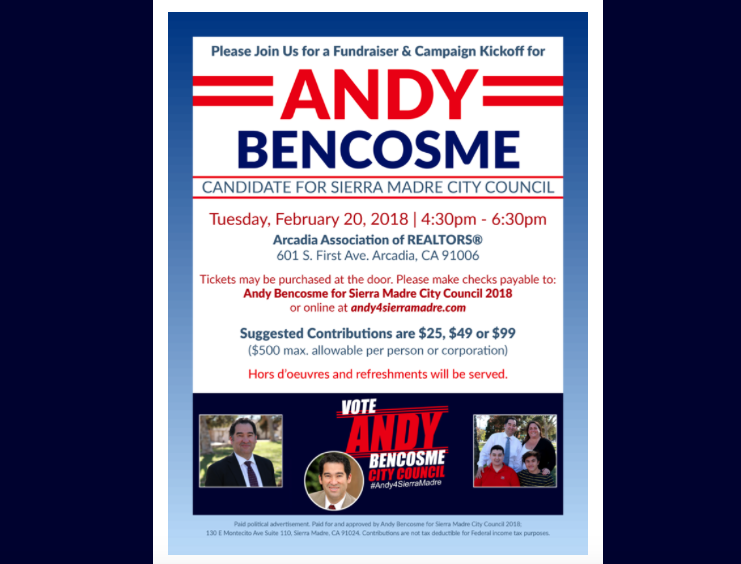 : Sierra Madre City Council Hopeful Andy Bencosme Is Holding His Campaign Kickoff Event In ... Arcadia? Sierra Madre City Council Hopeful Andy Bencosme Is Holding His Campaign Kickoff Event In ... Arcadia? Carpetbaggers of the world unite! OK, that was far too easy. Let's get serious for a few seconds. This self-proclaimed MENSA guy, Andy Bencosme, is he really as sharp as some people claim he is? If you think so, let me ask you a few questions. Ready? If you were running for City Council in Sierra Madre, and you happened to be a Century 21 Real Estate management guy of note, would you hold your big "campaign kickoff" fundraising event in the City of Arcadia? A place tragically afflicted with some very significant McMansion issues? Would you actually believe that there is no place in Sierra Madre good enough for so exalted an event such as yours? Would you purposefully avoid taking your business to some place in downtown Sierra Madre? Maybe because you think that none of the restaurants here are quite good enough for you and your chosen clientele? Would you be afraid that if your big event was held in Sierra Madre you might have to deal with some of the local riffraff? People you do not care to associate with too much? Or have to answer their annoying questions? There is also this. Would you restrict your campaign kickoff event to people who for the most part do not even live in the city where you are running for office? While purposely excluding many of those that actually do? Would you do that? Is there a reason? Look at the time this campaign kickoff event is taking place. 4:30 in the afternoon, and on a Tuesday. A time when most good Sierra Madreans are off somewhere else working for a living. Or fighting traffic on the freeways trying to get home. Or making sure the kids are doing their homework, while you are also cooking their dinner. The people that invitation went out to are predominantly corporate Realtors and millionaire developers. People who have not always had the best interests of Sierra Madreans at heart. Folks who only see this little place as an underdeveloped, though quaint, housing market ripe for the taking. A city where they could make lots of money, if only they were given the free reign to do so. It is literally all they care about here. So is this what Arcadia Andy's real constituency is? The people who he is running for office to represent? Big money out-of-town real estate and development players who only see Sierra Madre as a place to make a quick couple bucks in the bad neighbor housing racket? At the expense of the people who actually live here, and have for a long time? Apparently, and sadly, that answer is yes. Here is something else I should probably ask you. Would you have your event sponsored by an organization that has become notorious over the years for having worked to push high-density and McMansion development in Sierra Madre? A city that has prospered greatly by keeping that sort of predatory, and highly generic, development out? That is what the Arcadia Association of Realtors has been about for years. It is the same organization that spent a fortune ten years ago to stop Measure V, only to be dragged to the polls by the people of Sierra Madre and soundly beaten. But had they won? Downtown Sierra Madre would now look exactly like any other town that had been sold out to Andy's supporters. Sierra Madre has become a highly desired place to live and raise a family because it fought off those things. Property values here have risen to levels never before imagined. Why? Because this town stayed authentic. Generic McMansionization and stack/pack development were never allowed to set their roots here. But both have long been advocated by the AAR and the people invited by Andy Bencosme to attend his Sierra Madre campaign kickoff event. Which is being held in Arcadia. Attended by people who mostly don't even even live here. Yet each will gladly fork over a few hundred bucks to Andy Bencosme on February 20 because he will give them something that they have wanted for years. Unfettered access and the ability to to do whatever they want in Sierra Madre. Quid pro quo. No matter what the likes of you might have to say about it. It really is astonishing. Both crass and clueless, and at the same time. Does bring about many questions. His list of supporters on his web page is very interesting. Several realtors from here, one is his wife. And several realtors from Arcadia. Some business supporters from right here in Sierra Madre. The man has an agenda. Get on the council this year and in 2 years, Capoccia and Harabedian are termed out, and some of his cronies run for those seats. We’re back to the Walsh Mosca days. Don’t let this happen people. The council we have right now has been a good group. Keep them in office. In 2 years we can deal with interlopers then. We must re-elect the 3 incumbents who have protected Sierra Madre from the preditor developers. They may not be perfect but their record on preserving Sierra Madre is. Laugh bigly if you want, but remember that Trump won somehow. You never know. Never underestimate the ability of people to vote against their own interests. That is why Arcadia Andy needs all of that money. Jerry Pearson, the guy who wants to build 50 or so McMansions on the Monastery property, is from Arcadia. Are Andy and Jerry acquainted? A few McMansions here, some McCondos there. Pretty soon you’re talking real money. If he wants to win over the bulldozer set, he should have his shindig at the Only Place. and bring the carpet man too! Does Andy know very many people in Sierra Madre? The Arcadia Realtor's Association spent thousands of dollars to defeat Measure V. I will look back in my records and get the exact amount. They also brought in the PR firm Schubert Flint and that annoying twit Chip Ahlswede to run the No on Measure V campaign. I believe they spent $160,000 dollars on postcards and crap and still lost. Schubert Flint had more success with Prop 8, the California anti-Gay initiative that was later overturned by the courts. Such wonderful people they were. I remember that. Such awful people they were. The vote tally was close but control of downtown building was secured: Measure V was also known by the number it controlled: 2 stories maximum, X number of people per acre and X number of height in the stories (I cannot remember the X values, but someone does). The 3 incumbents will surely be reelected if only because they all live and play in Sierra Madre. Remember what it took with our $20,000 total against the realtors $160,000 to get Measure V passed. Volunteer NOW for Denise, Rachelle, and/or Gene to prevent the assault on Sierra Madre. Knock on doors, donate. Poster is right, Trump won. Andy never corrected the spelling and grammar errors on his campaign website. Maybe he has forgotten the password. The No On Measure V money came from Arcadia, and Andy's money is coming from Arcadia. I detect a pattern here. Why is he even holding a fundraiser? The Arcadia Realtor Association will be financing his campaign. His wife has even promised the Association would BUY our 4th of July Parade. For those of you who are new to the area. The Arcadia Realtor Association spend thousands and thousands of dollars trying to defeat Measure V which has protected our downtown area from Monster Development. Remember 72 Condos and 9,000 sq ft of retail where Taylor's Market is. Oh, how grand. McMansions on Parade. Will there be peacocks? Please. They're not peacocks. They're disco turkeys. Watch for flight patterns developing where monies flow in those 'weak candidates' who can not resist a bribe to do their bidding later 'pay now, get your wish later' all in a bad days work of corrupt politicians here in America 2018. No fear the money will be here. Why isn't Mr. Bencosme running for the Arcadia City Council? They have Harbicht and Chandler for that. Andy's job is to deliver Sierra Madre for them. I wonder if this isn't a strategy - Andy and his backers know that his connections to Arcadia will be seen clearly, and so they are getting out in front of it. He has nothing to do with this town, except to make money on it. It’s fairly clear that Congress can be bought. Why not the Sierra Madre City Council? I think with Andy that would be a prepurchase. A Wall is finally being built!—by Nunes and House Intelligence Committee Republicans to wall off Dem staff members from Repub staff members! This reveals the same level of maturity that existed when Herman and Grandpa had a fight and painted a white line separating their respective halfs of 1313 Mockingbird Lane. Nunes lives to impress his orange master with unabashed idiocy and has got to go. Time for Ryan to demote the fool. Why would the residents of Arcadia want to give their money to help our city council? Are they such unselfish and compassionate neighbors that they are lending a hand for the sake of our town? They just want to crack the Great Wall of Community Preservation. The barbarians are at the gate. Excellent question - the money. The people in Arcadia are going to give money to a Sierra Madre political wannabe. That's just weird. Arcadia Andy was president of the Association of Arcadia Realtors twice. He is the development candidate. Probably the most committed in years. I would like to go but I won't buy a ticket. Is there a way I can speak in the back? It amazes me that if there is an article about Trump on this blog, there are 80 plus bloggers. But when it comes to where you should start any political action is at the city level. Can these people not be bothered with the big picture. Our small town is really no different than Washington, D.C. You need to care about where you live, people. Get informed, get involved.Those little confabs at Starbucks and Beantown need to be discussions about what is happening here; not your hair or nails or what to plant in your garden. Very disappointing bunch! I agree that chat about hair and nails is pretty much a waste of speech, but the garden? That's a far better realm. You can never tell what articles are going to generate lots of conversation, or not. As the election goes on, I bet we'll see more interest in just who this Arcadia realtor is and what he wants with Sierra Madre. Also, a couple of times today I tried to log on, and blogger wouldn't load. Judy Webb-Martin supports Andy. Do you think she’ll be on The Tattler anytime soon? 4:43 - You have to refresh a couple of times. Some kind of Google glitch. Oh my goodness, Never elect a realtor or lives off of realtor donation that's a huge problem hiding bribes in fees etc. will always come back to bite them and the city from which they represent 20-18.
Who's the brilliant campaign manager who decided to emphasize Andy's real allegiances? Right? It is like Andy just proved that all of his detractors were right after all by choosing to kick off his campaign in Arcadia. Maybe this is something that wasn't supposed to get out? Don't overthink it. Andy is probably clueless. 4:43 I think you mean Meredith Keith. But who's really running the show? 5:12P Thank you. Exactly who I meant! Hey, I just got another library survey card in the mail. The first one was yellow, this one is green. Anyone know why there is a double mailing? Read the card inside. It's your second chance. No problem in spending the city's money on postage. If he wins Sierra Madre will NEVER again be the wonderful village that we all love. Get people out to vote against the thief. Well, he's originally from Florida, was in Monrovia 2009 - 2013 on the Library Board (President in 2012). Arcadia Association of Realtors during that time, as well, twice as Prez. When did he move to Sierra Madre? What's his local address? Does he actually live there? Maybe he sleeps on Josh Moran's couch. 6:49, no, he sleeps on Bulldozer Harbhict’s couch. Are these clowns that foolish that they think we all don’t know what it means when the various developers contribute cash to their slimy campaigns? You people are a shameful group of jaded, hateful loosers. Get a life. Goodness, what has got you in such a tizzy? 7:56, Bulldozer Bob- that’s no way to talk about your district 2 supporters. All 2 of them.